today, we celebrate the memorial Mass for mama g at st. vincent's. over the upcoming three weeks, i will be there four times - two times for weddings, and her vigil last night and her memorial today. seems like ages ago (7 years) that michael g and i volunteered there together in life teen with vickie, stella, mike, carly and the gang. in winter of 2005, mama g first asked me to speak at her vigil. greatly humbled and not quite ready to think about that...i said yes. 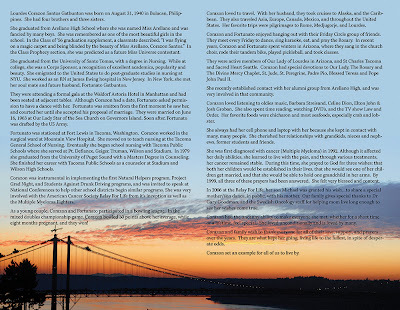 it wasn't until i designed her memorial spread with Michael and Christine (above) that it really began to sink in. the vigil had the most beautiful tribute to mama g - with the liturgy of the word, a slideshow of her life, complete with her 'thank you' sharing video from her birthday celebration last fall. there was not a dry eye in the church. Peter Kreeft once said, "The nearness of death is a harsh but effective teacher. And it teaches also a second lesson, not to mind but to heart: the infinite preciousness of life. When every little thing becomes perhaps the last, every little thing becomes a big thing. Why must we wait till death is near to see this?" Many times we ask “why”. I know I did. Why Mama G? The right question is…where do we go from here? 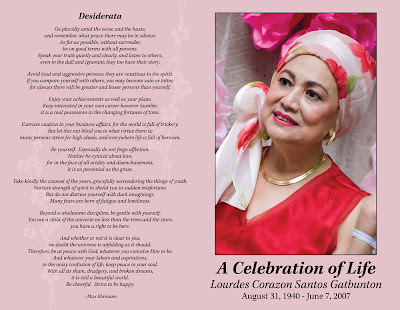 Mama G’s life leaves an indelible legacy on our hearts. How can we glorify God and use her as an example? She taught us about grace through suffering. She united herself with the cross through her cancer. As Christ embraced his cross, she too embraced her own. She never did. She offered up her pain for those she loved. She taught us to love, unconditionally. When we don’t want to, when we don’t feel we can, when we don’t have the energy. Simply love with our whole heart. She taught us to serve with our whole hearts. She served Fort as a godly wife. She served Michael and Christine with all she had, even to her last day. Finally, Mama G taught us to turn to our Lord and the Blessed Mother for refuge and peace in good times and bad. A year ago today, on Father’s Day, I attended Mass at St. Charles with Mama and Papa G. At Mass, we celebrate how Christ’s body was broken for us. Mama G’s body was broken too. And yet, in heaven, we are all resurrected in Him. In one of Michael’s last postings before she passed away, I loved the image of St. Peter arranging crowd control at the gates for her arrival. What a powerful saint in heaven we have in her. And our response to her influence in our lives? To rise to the challenge of her saintly example, so that when she greets us in heaven with St. Peter, she will see her fruits in us through the way we lived our lives. fort, michael and christine, thank you for letting me be a part of her life.